Members of the Amateur Radio community have volunteered to assist in the ongoing recovery from Hurricane Maria, which devastated Puerto Rico and Dominica and, to a lesser extent, the US Virgin Islands. This week, 50 of the most accomplished US radio amateurs responded within 24 hours to a call from the American Red Cross (ARC) to deploy to Puerto Rico and provide emergency communications assistance there. At the ARC’s request, ARRL rallied the US Amateur Radio community to provide up to 25 two-person teams of highly qualified hams. ARRL CEO Tom Gallagher, NY2RF, said that more than 350 answered the call, from nearly every state. The group’s principal mission will be to move health-and-welfare information from the island back to the US mainland, where that data will be entered in the Red Cross Safe and Well system. The Salvation Army Team Emergency Radio Network (SATERN) has been asked to assist these operators when they check in with tactical, health-and-welfare (H&W), and Safe and Well messages. SATERN and other active nets are not accepting incoming H&W inquiries. The Caribbean Emergency and Weather Net (CEWN) is taking incoming H&W inquiries via e-mail for Dominica. The Puerto Rico Federal Affairs Administration (PRFAA) is taking inquiries (only one per sender) via e-mail for Puerto Rico. Inquiries should include the full name and location of both the sender and the individual(s) being sought and the sender’s e-mail address. 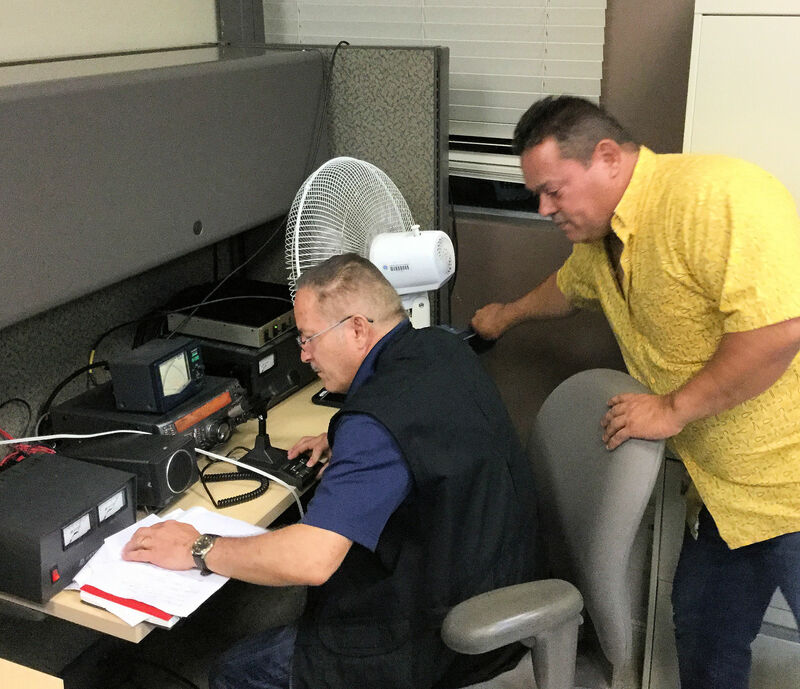 Denis Santiago, WP4KJJ (right), and Raul Gonzalez, KP4RGD, organized the communication network in Puerto Rico and operate the station at American Red Cross’s temporary San Juan headquarters, “with a great number of hams who left their families to help Puerto Rico to recover,” ARRL Puerto Rico Section Manager Oscar Resto, KP4RF, told ARRL. 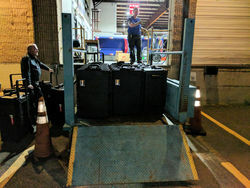 The League also is sending two VHF repeaters, a dozen hand-held transceivers, five mobile radios, what Gallagher described as “5 cubic feet of batteries,” a number of small 2-kW portable generators, and solar-powered battery chargers. The hams and their equipment will be sent to Red Cross shelters extending from San Juan to the western end of the island. The Yasme Foundation announced this week that it has made a grant to ARRL’s Ham Aid fund, in support of the Amateur Radio response to the recent hurricanes in the US and Caribbean. The Ham Aid fund was created in 2005 in response to the need for equipment and resources to support the Amateur Radio response to hurricanes Katrina, Rita, and Wilma. A September 27 CNN report documented the personal impact of the storm on Puerto Rico and Amateur Radio’s role in the recovery. 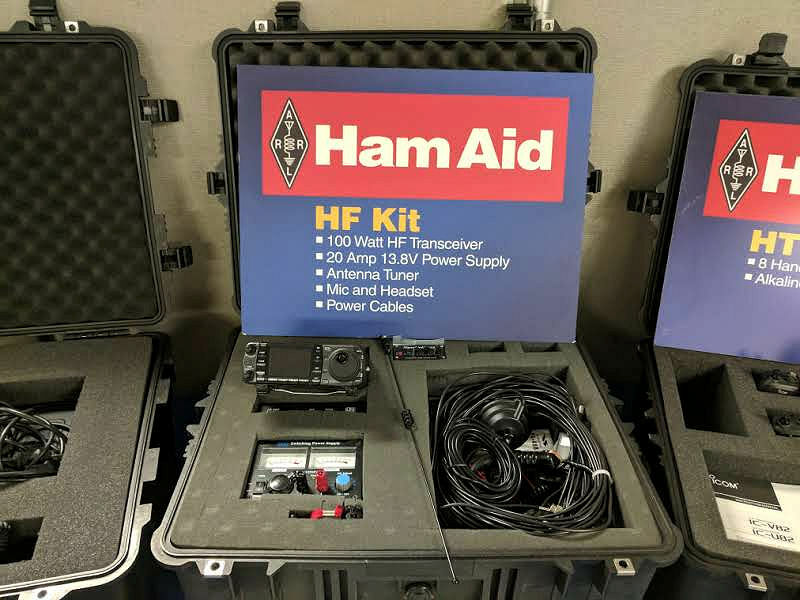 ARRL has previously staged Ham Aid equipment in Texas as well as supplied kits to Florida, the US Virgin Islands, and Puerto Rico. With the Ham Aid inventory depleted, donations are needed now. Contributions to Ham Aid are 100% tax deductible. To donate online, select “Ham Aid” from the ARRL donation form. To donate by mail, print a donation form, and mail it with your check payable to ARRL, noting “Ham Aid” on the memo line of your check. Mail to ARRL, 225 Main St., Newington, CT 06111 USA. The Gossip Net is looking for another Alternate Substitute Guest Host. The Gossip Net is Tuesdays at 8:30pm on the SCARS VHF repeater. If interested, please contact Lucky – KG5MXA, Victor – K5VL, or Denny -WA6DKD. Editor’s Note: If you do not know what an “Alternate Substitute Guest Host” is, you should tune-in to the Gossip Net to find out! The FCC has announced that the Office of Management and Budget has approved, for 3 years, the information-collection requirement of the Commission’s March 29 Report and Order (R&O) that spelled out Amateur Radio service rules for the two new bands — 630 meters and 2200 meters. Notice of the action appears in today’s edition of the Federal Register. Before using either band, stations must notify the Utilities Technology Council (UTC), formerly the Utilities Telecom Council, that they plan to do so, and if UTC does not respond within 30 days, they may commence operation. Section 97.313(g)(2) of those rules requires that, prior to starting operation in either band, radio amateurs must notify UTC that they intend operate by submitting their call signs, intended band(s) of operation, and the coordinates of their antenna’s fixed location. The new rules do not permit any mobile operation. Click HERE to access the UTC notification website. The Doctor’s tips for success when working with molten metal, otherwise known as the art of soldering. It also helps to know the art of unsoldering, when things do not go as planned. 10. Activity will be on 80 to 10 meters. QSL via 7X2DD. October 10 as FR/ON6KE on 80 to 10 meters using CW, JT65 and FT8. QSL via ClubLog, LoTW or eQSL. using SSB, CW, RTTY and PSK. QSL via LZ1GC. 15 and 10 meters. QSL via home call. and RTTY. QSL V63FKR via JR1FKR and V63MLO via JH1MLO. on conditions. QSL via VU3NPI. such as JT65 and FT8. QSL via M0OXO. September 29 and 30 on the HF bands using SSB, CW and digital modes. QSL via LoTW, eQSL or ClubLog. SP9FIH will be QRV at E44WE from October 18 to 29.
possibly RTTY. QSL via SP9FIH. using CW. QSL via his home call sign, direct or by the Bureau. 80-Meter SSB Contest and Phone Fray are all scheduled for October 4. September 29, 2017 in Weekly Newsletters. ← National Weather Museum 1st Anniversary Today!